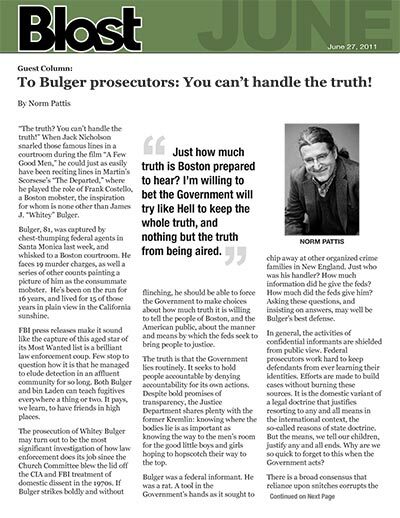 To Bulger prosecutors: You can’t handle the truth! “The truth? You can’t handle the truth!” When Jack Nicholson snarled those famous lines in a courtroom during the film “A Few Good Men,” he could just as easily have been reciting lines in Martin’s Scorsese’s “The Departed,” where he played the role of Frank Costello, a Boston mobster, the inspiration for whom is none other than James J. “Whitey” Bulger. Bulger, 81, was captured by chest-thumping federal agents in Santa Monica last week, and whisked to a Boston courtroom. He faces 19 murder charges, as well a series of other counts painting a picture of him as the consummate mobster. He’s been on the run for 16 years, and lived for 15 of those years in plain view in the California sunshine. FBI press releases make it sound like the capture of this aged star of its Most Wanted list is a brilliant law enforcement coup. Few stop to question how it is that he managed to elude detection in an affluent community for so long. Both Bulger and bin Laden can teach fugitives everywhere a thing or two. It pays, we learn, to have friends in high places. The prosecution of Whitey Bulger may turn out to be the most significant investigation of how law enforcement does its job since the Church Committee blew the lid off the CIA and FBI treatment of domestic dissent in the 1970s. If Bulger strikes boldly and without flinching, he should be able to force the Government to make choices about how much truth it is willing to tell the people of Boston, and the American public, about the manner and means by which the feds seek to bring people to justice. The truth is that the Government lies routinely. It seeks to hold people accountable by denying accountability for its own actions. Despite bold promises of transparency, the Justice Department shares plenty with the former Kremlin: knowing where the bodies lie is as important as knowing the way to the men’s room for the good little boys and girls hoping to hopscotch their way to the top. Bulger was a federal informant. He was a rat. A tool in the Government’s hands as it sought to chip away at other organized crime families in New England. Just who was his handler? How much information did he give the feds? How much did the feds give him? Asking these questions, and insisting on answers, may well be Bulger’s best defense. In general, the activities of confidential informants are shielded from public view. Federal prosecutors work hard to keep defendants from ever learning their identities. Efforts are made to build cases without burning these sources. It is the domestic variant of a legal doctrine that justifies resorting to any and all means in the international context, the so-called reasons of state doctrine. But the means, we tell our children, justify any and all ends. Why are we so quick to forget to this when the Government acts? So into court now walks Whitey Bulger, a man with a past, a reputed mobster, accused of murdering 19 and running Boston’s Winter Hill Gang as though he were a medieval potentate. He was an outlaw, right? A mass murderer, right? The Devil’s own agent, correct? He was also a snitch for the feds, a tool Uncle Sam used against its enemies. Just how dirty are Uncle’s hands? We get the government we deserve. A government that relies on lies, practices deceit, and looks askance at murder is a government unworthy of our respect. Hence, the Achilles Heel in the case of United States v. James Whitey Bulger. How hard will the Justice Department fight to keep us from knowing the truth about the FBI and those who used Bulger as he used them? I am guessing the Government will declare these truths to be irrelevant. Bulger is in the fight of his life now. The Government doesn’t count the money it spends; it weighs it after taking it from us. And then it lies to us to get what it thinks we need. An aggressive defense of Whitey Bulger might yield an uncomfortable truth: when the Government and organized crime get into bed together, we can’t tell the difference between the two. Just how much truth is Boston prepared to hear? I’m willing to bet the Government will try like Hell to keep the whole truth, and nothing but the truth from being aired.An odd turnabout that we now depend on Whitey Bulger to tell us truth. I’m betting the Government won’t let him or the Government’s agent tell it. And that might be Bulger’s best defense.